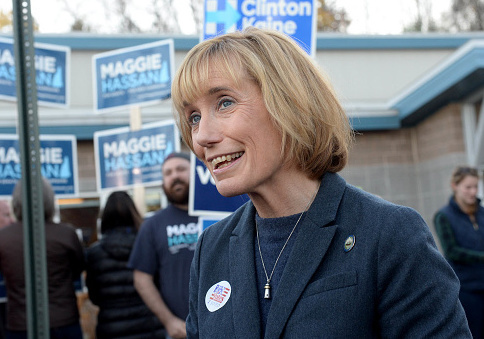 Senator Maggie Hassan accused Republicans of marginalizing victims of sexual assault, despite naming to her campaign committee a teacher who admitted to sexual misconduct with a student. On Friday, Sen. Hassan (D., N.H.) made the rounds on cable news to decry Republican handling of Christine Blasey Ford's allegation of sexual assault against Supreme Court nominee Brett Kavanaugh when both were high school students. Kavanaugh has categorically denied the allegation—as well as another made by a Yale classmate—while three witnesses named by Ford say they cannot recall the alleged incident. "It's so hard for survivors of sexual assault to come forward, especially when they are traumatized teenagers as Dr. Ford was," Hassan told CNN on Friday. President Donald Trump "is really trying to marginalize her and attacking her and trying to shove her back into the dark." She later told MSNBC that "Dr. Ford's concerns about her safety and about feeling respected in the process really need to be honored." Hassan has her own ties to sexual misconduct controversies at elite private schools. She named longtime Phillips Exeter Academy history teacher Rick Schubart and his wife Caren to two leadership committees during her 2012 gubernatorial campaign. She tapped them for those positions just months after Mr. Schubart confirmed to Hassan's husband, Tom, who served as the boarding school's principal from 2009 to 2014, that he had a sexual relationship with a high school student in the 1970s. Her husband's process for handling decades-old complaints—as well as her vetting procedure for campaign endorsements—has been widely criticized. Mr. Hassan forced Schubart to retire following the confession but allowed him to retain emeritus status and did not alert students or families about the incident. It did not come to light until the Boston Globe reported that Schubart had been barred from campus after a second former student came forward with a similar allegation in 2015. Mr. Hassan called his handling of the scandal "inadequate," though he claimed he hushed up the scandal out of respect for the victim's privacy. The Association of Boarding Schools later censured Hassan for not raising the issue when the organization gave Schubart an award in 2012. In August, a law firm investigation commissioned by the school found that beginning in the 1970s and continuing through Hassan's tenure, Phillips Exeter used a dual record keeping system, in which principals and deans maintained confidential personnel files that "resulted in other administrative staff members having an incomplete view of" employee behavior. Phillips Exeter has now adopted mandatory reporting training for faculty members after entering into a memoranda of understanding with local police. Sen. Hassan denied having any knowledge of the incident when she named Schubart to the campaign post. When confronted with the scandal during her 2016 campaign she said, "I apologize for that," but maintained that her husband never told her about the incident. New Hampshire attorney general Joseph Foster, a Hassan appointee, declined to investigate the matter, while the state Division for Children, Youth, and Families said it may have destroyed all records relating to a 2011 investigation into Schubart. Hassan's office did not respond when asked about the scandal. A woman who answered the phone at Schubart's New Hampshire residence hung up the phone. Mr. Hassan did not return request for comment. This entry was posted in Politics and tagged Maggie Hassan, Sexual Harassment. Bookmark the permalink.